Django is a web designing software that facilitates the web developer to create applications for websites without having to care much about start-up details because while working with Django it is one less thing to worry about. It provides the skeletal basis for the programming and rapidly caters to the user-data interface as it has brought changes in terms of static and dynamic webpages, favourable to consumer needs. 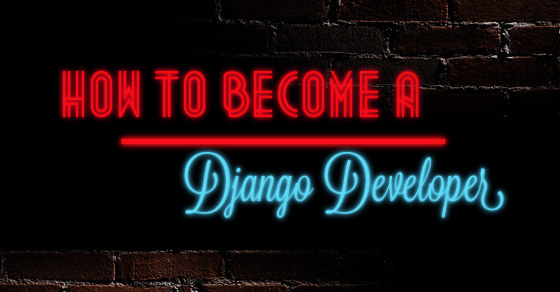 However, as easy as it sounds handling Django project can be quite the task, so here are a few pieces of advice on how to successfully become a Django developer. Your first priority while planning to become a Django web developer, should be sharpening your programming skills. Big websites like Instagram, Pinterest, Bitbucket all use Django as their framework developer, so one needs to be highly at par with the programming languages used to build the high-speed applications that nowadays are taking social media by storm. Since Django programming is written in Python it is quintessential for the programmer to be already educated in programming languages like Java or any other OOPs languages that may seem helpful. The real agenda behind creating websites, software and applications is to meet the demands of the public since now its an era of technology and most sectors have been trained to use the resources to their benefit. But due to a large number of adversaries, it has become essential that the websites stand out from each other in terms of design and function so much that users find one website more useful than the other. This factor keeps Django continually in competition with other web designing companies. The programmer, therefore, has to have a keen eye for Architectural Pattern so that he/she can build the application adequately sufficient both in appearance and in function pertaining to user need. It is necessary that you have acquired sufficient knowledge and skill in the language before trying a hand in the professional arena. Being able to assess yourself on your skills regarding the requirement is one great advantage since more often programmers who do not have complete knowledge of python and java poorly perform on trial assignments and projects given by a company. However, it is of critical importance that the developer understands all nooks and corners of the programming language because while running the MVC (Model-View-Controller) he/she will have to compress the details in brackets on his/her own, unlike other frameworks. A good way to start your career as a Django web developer in the US is to plan early and take every step accordingly. Like you, hundred other aspirants are going to start preparing with regard to their perspectives in career, so before you jump the gun, lay out a few conditions for yourself to follow depending on the genre of applications you would want to design or software’s you would want to build. Once you have made up your mind, opt for Django tutorials for beginners, first to learn the basics and later to excel on your skills. When you have time on hand, utilize it to improve on your programming skills because to face it you will have to give the company a reason as to why they should hire you. And chances are that everyone applying at Django would be just as prepared, so make sure that you are giving your 100% through your efforts. Even so, subscribing to various top company magazines of the US, may be a great way to make sure that you are getting the best of both worlds. With this strategy, you can prepare yourself aggressively in keeping with the trends the companies these days follow. Once you have reached a certain level of mastery over programming language, you can put your talents on a little display by taking up small projects for new but rising companies. This is a great way of setting your foot in the long run because once you have successfully managed to capture the company’s attention, chances are that they will hire you for good. And getting recruited by a fresh company is even better than being employed by a company been long in the race as this provides you with the opportunity of being one of the first employees constituting the backbone of the company. Working for Django is not going to be the same as jumping on a bandwagon since this growing trend is evidently going to remain at large. Rest assured, with the rise in technology, the need for web developers is all-time high. Moreover, it has a multifarious job scenario, which is to say that to suit your purpose you can choose from a variety of options related to programming depending on your bent of mind. Furthermore, you can decide whether you want to become a Back-End web developer (who is assigned to look into the technicalities), a Front-End web developer (one looking after the appearance) or a webmaster that maintains and makes sure that the website is functioning properly in keeping with time to time updates and user feedback. Since keeping track of the rising demand among the corporate commuters has never been easy since every other web designing, is time and again coming up with new functionaries to keep users from zoning out, you have to take extra precaution to smell the air in market and work accordingly based on your position in the group of programmers handling a project. Nonetheless, it is equally important to be creative while being technically adept because it is the thinkers who actually brew ideas that is slowly brought to life by the developers. Think of new ways on how to update your applications so as to help the users by making their works easier and at the same time adding more members. Again, one great side to being a web page developer is that with time and experience, you can afford to start your own designing domain and Django can all the more help on this path to greatness. Once you have gathered enough experience to take up and finish big projects almost single-handedly and have gained a substantial amount of knowledge, only then can you take a chance to try your hand forming your own team of entrepreneurs. Nevertheless, these kinds of start-up designer domains in the country do need a good sponsor so to cover that, make sure you have been handling your clients correctly and honestly because losing any potential source of help at any point of time defeats the purpose. Certainly, web designing is new to the world of professional prospects but that also means more room for workers, therefore working for a web designing company definitely guarantees a place in the commercial arena and is also going to pay dividends along the way since it is a fast growing business that is far from losing a step. This is also a great opportunity for you to scan through a number of talented web designers in the US if you are planning to take the long leap of faith into the entrepreneurial market. Nevertheless, Django is one of the most renowned web framework programmes in terms of charity as it is a 501(c)(3) non-profit web designing organization. Therefore it gets a full-fledged waiver from paying any kind of tax to any governmental or federal department. There is no so-called provision of Django certification at the moment but efforts are being made to include that as a part of the training programme for interns. This is nowadays all the more important because of the constant need for affidavit along with every other certificate and documents for any legal procedure. Nonetheless one can always fortify one’s resume with degrees and certificates prior to joining Django. Once you have got in and in case of any other opportunity or instance of a procedural emergency, one can always use the experience acquired at Django as an additional attribute. Moreover, if you are having to immigrate in or out of the US, a recommendation from Django can take care of a lot of problems on your way to finding work at a new place. Do not let your leisure time go to waste rather shape those ideas you have had on your mind for a while. If necessary ask for help; ask your seniors for guidelines on how to improve on your programming lest you overlook something that might cause a major setback in the future. Do not shy away if you are already aware of a problem that is not letting you set high goals, rather talk to someone about it and make sure you get the sufficient amount of help you need which will not be hard to get since the Django web page developing team is like a family. On the other hand, if you are an efficient worker and you know that you are capable of producing more than you already do, then do not sit idle but try adding a new feature to the application your team is currently working on. Since it is not quite easy to find a work at Django it is best that instead of losing heart you start signing up for contests which besides being fun can also help you to get earmarked by one of the company recruiters present at the venue. This calls for you to stay alert on any insider news as all rumours that fly around are not hoax. Moreover, if you are passionate about web designing you cannot pass up an opportunity of showcasing your talent regardless of whosoever judging your performance. This way one can cope with the new things one may learn at these kinds of constructive contests as well as bask in the golden opportunity of getting recruited by one of the world’s leading web designing companies. Find new ways to be productive to come under the radar of recruiters attending hackathons. Be a part of online Facebook pages to keep yourself updated with what is new on the American market. Most important of all a good web developer has to have his/her way with designing in order to impress the clients who in turn can benefit them in all sorts of ways. Furthermore once you have successfully managed to bring about the desired effect on a project, you are sure to receive many more assignments owing to your credibility. Salary for Django developers, depends on their projects pertaining to the different sector of management where they have to lend their services. For example publishing industries mainly focus on the appearance while also keeping it easy for the buyers to feel at ease with the site without being confused about what to click on. So the salaries also depend on the contract the company is signing depending on the investment made on the overall project. Similarly professional, religious, civil, private and public organizations need web developers to reinforce their respective websites in order to make accessibility easier for the common people. In this epoch of groundbreaking technology, it has become imperative to highlight all the products on the market displayed throughout various types of websites so as to bring it to light and make it known to the common man. And what better way to make this happen than to become a Django developer with the righteous burden of bringing technological justice to all those in need of it. This having been stated, becoming a web page developer at Django, has its own glorious and promising aspects.